Relative Strength Index (RSI) — is one of the most popular indicators (oscillators) of technical analysis. Its author is J. Welles Wilder published his research as early as in 1978. All information about RSI can be found in the "New concepts of technical trading systems". Wilder recommended to apply Relative Strength Index calculated for 14 days' period, but also periods for 9 and 25 days are often mentioned. This index is calculated based on relation of average value of positive growth of close price of bar (in relation to close price of previous bar) to total amount of price increment. At the period of 14 days the index expresses an average value of all positive increments in price, then – it shows an average value of all negative increments. Essentially, RSI is exactly the relation between average value of positive growth of close price to the sum of average values of positive and negative increments. 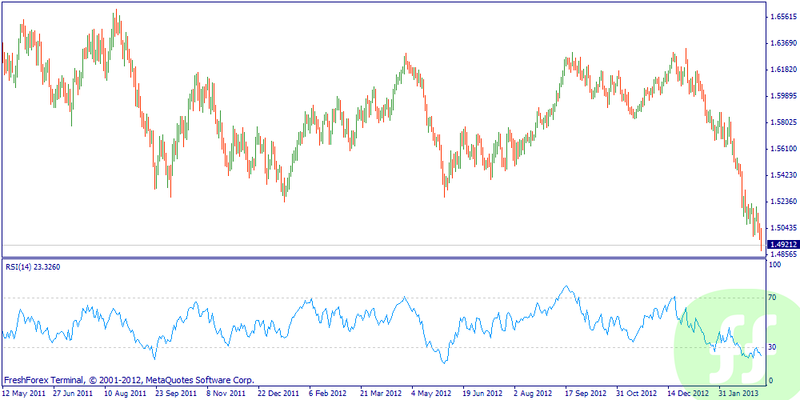 RSI fluctuates within the range from 0 to 100, because average value of the index is multiplied to 100. The shorter applied period for this indicator is, the more sensitive towards price fluctuations it gets. The indicator's helpful feature is that in some cases formation of RSI reversal on the top and bottom points occurs earlier than reversals of price itself. That allows opening transactions with lower risk. Besides, for interpretation of RSI figures you can turn to methods of classical chart analysis. It is very often when patterns of chart analysis form a little earlier than such on price chart. Support and resistance levels and lines are instant on RSI chart. When the first top of oscillator is based in overbought zone (that is to say, above 70) and the second top is beyond this zone, divergences play greater role. The opposite situation may occur in overbought zone. When price is forming a new minimum point and RSI curve is not, we face a typical divergence – signal for purchase. RSI (as all oscillators, though) is better to apply together with another trend indicators. Upon that, trend indicator will set directions for buying or sales, whereas oscillator will show the best time for entrance.